The impact of friction stir processing (FSP) on the structure and mechanical properties of the age-hardenable aluminum casting alloy A206 was investigated. FSP nearly eliminated the solidification shrinkage porosity present in the as-cast condition. FSP significantly increased both the strength and tensile ductility of cast A206 alloy. When applied to A206 that had previously been solution-heat-treated and aged, FSP resulted in a more moderate increase in strength; however, ductility was notably increased. A206 that had been subjected to FSP was found to respond to artificial aging treatment. Fatigue resistance was also found to be significantly enhanced in A206 after FSP. The entire S–N curve is favorably shifted after FSP, and more importantly, fatigue strength at 108 cycles nearly doubled from about 85.5 MPa in the as-cast condition to 165 MPa. These results point to FSP as an effective way to locally enhance the mechanical properties of cast Al components. The earliest application of FSP was for the repair of cracks/defects in Al-based cast components. Previously, defects in cast Al castings were repaired using arc welding; however, the latter with its nature of high-temperature local melting and subsequent fast cooling resulted in other detrimental issues: oxidation, weak heat affected zone, deformation, and secondary cracks. When FSP emerged as a solid-state processing method, it was well received as it alleviated many of the issues that existed with conventional repair methods. Many studies followed addressing various aspects of FSP; for example, Ma et al.15,16 conducted a study of FSP on sand-cast A356 alloys. They studied the effects of process parameters and found that FSP broke and dispersed the coarse acicular Si particles, resulting in a uniform distribution of Si particles in the aluminum matrix with significant microstructural refinement and reduction of cast defects. Such structural refinement resulted in mechanical property improvements. Though extensive studies of FSP in Al alloys were performed,3, 4, 5 it was mostly applied to wrought alloys. A well-established process for cast components with a fundamental understanding of the mechanisms leading to such refinement has been lacking. It is anticipated that the starting structure and properties of the workpiece will influence the results obtained subsequent to FSP processing. Therefore, it is not clear what is the relevance of the work done on wrought alloys to cast alloys. In this study, we focused on A206 aluminum alloy—an important and widely used Al casting alloy because of its high strength and good machinability. The motivation behind this study was to confirm and demonstrate FSP as an enabling technology for processing of cast Al alloys. Furthermore, FSP opens the space for cast structures to be locally manipulated to attain wrought material attributes, as well as to expand the design space, especially for cast components that require good dynamic properties. As-cast (AC) + FSP FSP was directly performed on the surface of the as-cast work piece. AC + T4 + FSP FSP was performed on the cast work piece that had been solution-heat-treated and naturally aged to a T4 temper prior to FSP. Raise temperature from 25 to 460 °C in 1 h → continue to increase temperature to 480 °C in 1.5 h → hold at 480 °C for 2 h → raise to 518 °C in 0.5 h → hold at 518 °C for 10 h → quench in 65 °C water → naturally age for 5 days. AC + T7 + FSP FSP was performed on the cast work piece that had been solution-heat-treated and aged to a T7 temper prior to FSP. Solution heat treat and quench as for the Heat-Treatment Type 1 path, and then hold for 24 h at room temperature → age 4 h at 200 °C → cool to room temperature in still air. AC + FSP + T6 FSP was applied to the as-cast part which was then heat-treated. Solution heat treat and quench as for the Heat-Treatment Type 1 path, and then hold for 24 h at room temperature → age isothermally at 155 °C for different times. FSP was performed on a HAAS M3 CNC machine at WPI. The tool used for FSP has a shoulder with a diameter of 16 mm with a screwed taper probe at its end. The length of the probe is 3.2 mm. A tilt angle of three degrees was applied during processing to generate a forging action at the trailing edge of the tool. The two key processing parameters used were: tool rotation speed of 1000 RPM and tool traverse speed of 50.8 mm/min. 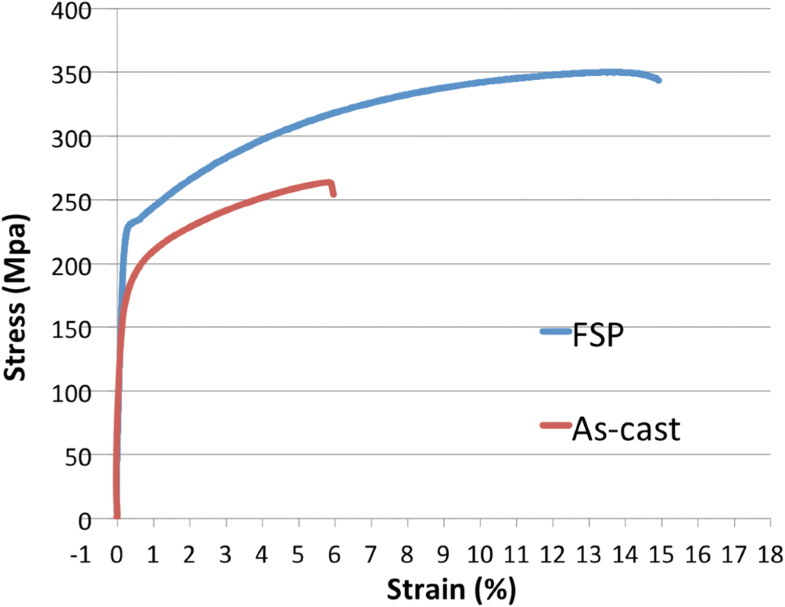 Tensile properties and fatigue properties were measured to evaluate the effects of FSP on the performance of the cast A206 alloy. The specimens for all the tests were sectioned from the FSP-affected regions. To provide sufficient sizes of FSP-affected regions for the different type specimens required, work pieces of two thicknesses were processed and two different tool geometries were utilized. Specimens for tensile tests were sectioned from the 6.26-mm-thick work piece, in which the depth of the FSP region was 5 mm. Specimens for the fatigue test were prepared from the 16-mm-thick work pieces, where the depth of the FSP region was 15.4 mm. Metallographic analyses were performed using optical microscopy and scanning electron microscopy (SEM). For analysis using the optical microscope, samples were sectioned perpendicular to the FSP traverse direction. The samples were ground, polished, and analyzed in both as-polished and electrochemically etched conditions. Barker’s agent was used for etching to reveal the grain structure inside the FSP region. Fractographic examination was conducted using a JEOL 7000 SEM. Specimens for tensile testing were sectioned from the FSP nugget region ensuring that the whole of the sample was processed. Each specimen was taken along the FSP centerline as shown in Figure 1. The specimen had a 25 mm gauge length with a cross section of 12.5 × 6.3 mm in accordance with ASTM standard E8. The test was conducted at room temperature using the Instron model 5500. The crosshead speed was set at 1 mm/min, and strain was measured using an extensometer of 25 mm gauge length. Specimen for the tensile test: (a) schematic diagram of the tensile bar; (b) image of the tensile bar. Ultrasonic fatigue tests were conducted at the facilities in the Material Science and Engineering Department of the University of Michigan. Testing was conducted at room temperature in the ambient air over a range of stresses using fully reversed load (R = −1). 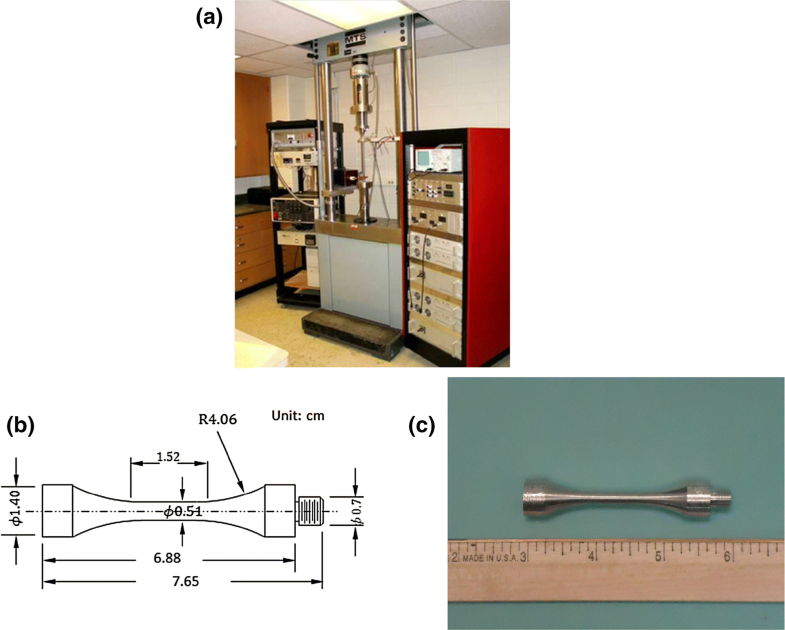 Figure 2 shows the ultrasonic fatigue test apparatus and the geometry of the ultrasonic fatigue test specimen. The specimens had a cylindrical gauge section, and they were turned down from a rectangular bar; dimensions of the bar were 150 (L) × 14 (W) × 14 (H) mm. For the FSP’d specimen, the gauge section was manufactured from the FSP nugget to ensure homogeneity of microstructure. In order to have a consistent surface finish with low residual stress, samples were polished along the longitudinal direction to reach a Ra value of 0.2 µm; surface finishing was performed by Westmoreland Materials Testing in Youngstown, PA.
Ultrasonic fatigue test apparatus: (a) ultrasonic fatigue test instrument; (b) fatigue specimen geometry; (c) image of a fatigue specimen. where A is the 2-D projected area of porosity. 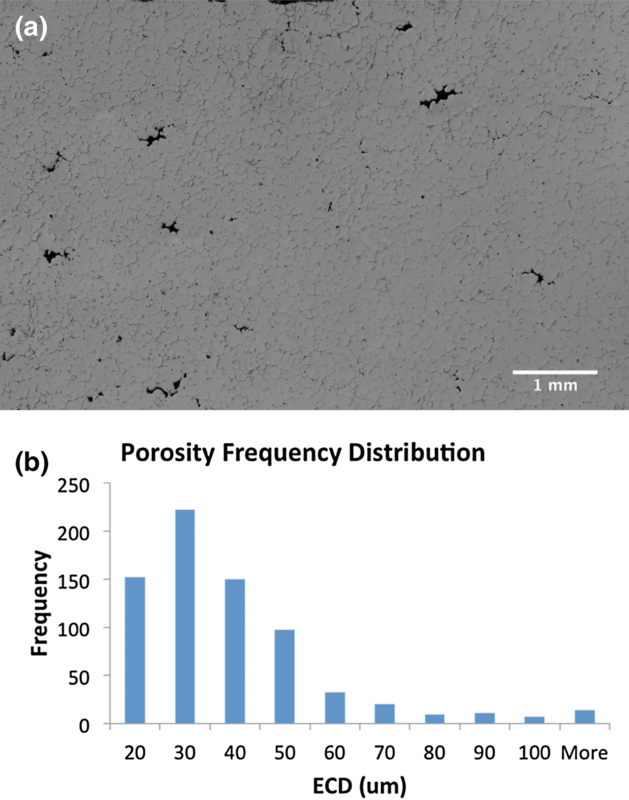 Casting defect analysis: (a) distribution of porosity within a large area of as-cast A206; (b) plot showing the frequency distribution of observed porosity equivalent circular diameters. The average porosity ECD was 37 μm, and the total area fraction of the microshrinkage porosity was 0.65%. Figure 4b shows the ECD frequency distribution histogram. More than 80% of ECDs were between 20 and 50 μm. No data are shown for the FSP’d condition because after FSP more than 97% of pores were closed due to plastic movement of the material under the applied downward and shear forces. Clearly, FSP is a viable means of mitigating porosity in cast components. where UTS is the ultimate tensile strength in MPa, k is a constant whose value is typically 150 for aluminum alloys, and E is the elongation in %. 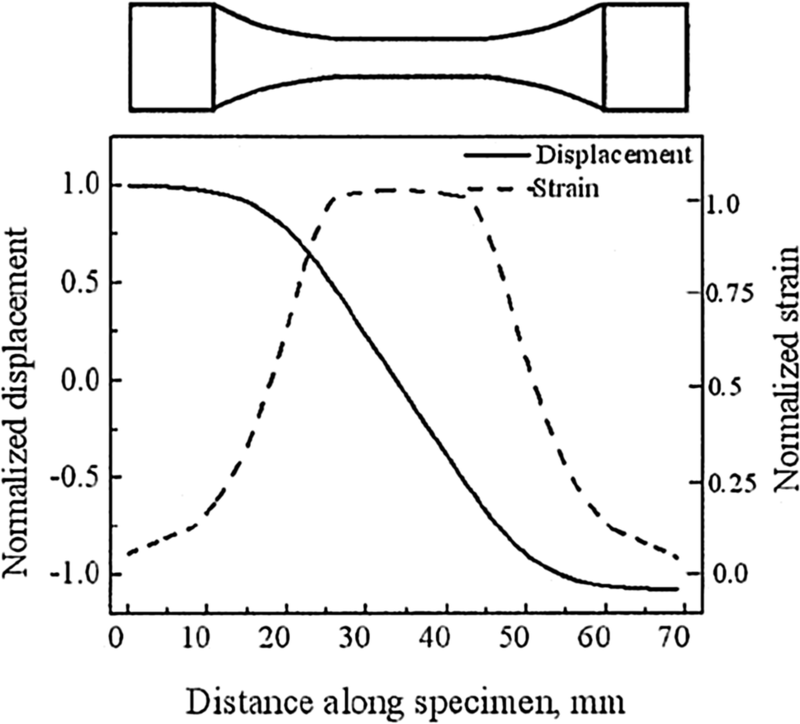 Representative engineering stress–strain curve for (a) as-cast A206; (b) FSP A206. Table 1 lists typical tensile properties of the material in various conditions. The AC + FSP material showed enhanced tensile properties over the AC material with the QI increasing from 374 to 522 MPa. The increased strength is attributed to the refined grain structure and substructure within the grains as a result of FSP. FSP involves substantial deformation at elevated temperatures and introduces a large number of dislocations in the material in the work zone. After local lattice deformation is complete and the material is raised to an elevated temperature for a short time, recovery and recrystallization, a transformed grain and substructure that is significantly finer than in the as-cast structure forms. The elimination of the majority of the shrinkage porosity by FSP is also believed to assist in increasing the UTS of the material. Unlike work hardening observed in wrought alloys subsequent to cold working, the increase in strength with FSP does not result in any reduction in the ductility of the material. Instead, the elongation of the A206 work piece increased by more than 150%. FSP is a dynamic hot working process involving work hardening, recovery, recrystallization and porosity reduction that, when applied to a cast aluminum alloy, results in a refined microstructure with improved mechanical properties. 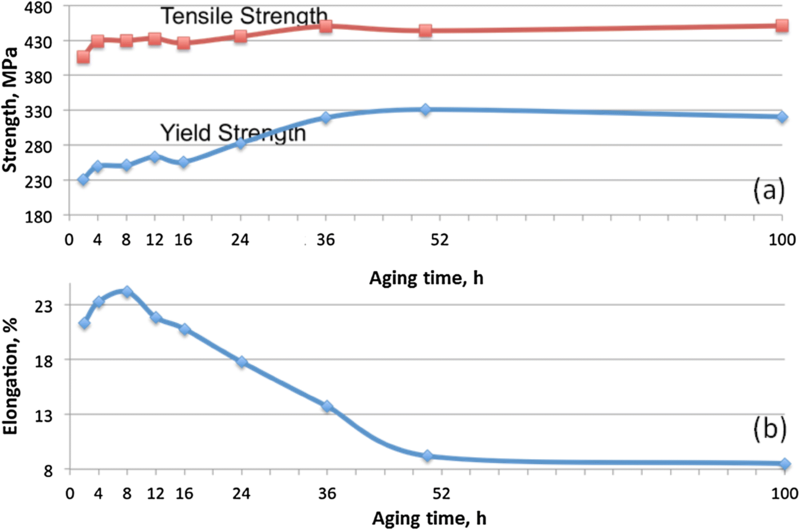 Strength can be generated by aging the solution-heat-treated and quenched material at room temperature (natural aging) such as we did in the T4 process. In this case, strengthening is attributed to the distribution of copper atoms changing from random to disk-like planar aggregates (GP zones); these form on particular crystallographic planes of the aluminum matrix.22 GP zones cause coherency strain fields that increase the alloy’s resistance to deformation. Higher strength can be generated by aging the solution-heat-treated and quenched material at an elevated temperature (artificial aging) such as the case with the T7 process. In this work, the alloy was brought to a condition beyond peak strength, so the material is in the overaged condition; this implies that precipitates (θ′ and θ) are large in size, whether they may be semi-coherent or incoherent with the matrix. An overaged temper can be used to provide improved dimensional stability and stress corrosion cracking resistance. AC + T4 + FSP and AC + T7 + FSP samples showed higher elongation and QI values than the AC + T4 and AC + T7 samples. In terms of strength, the effect of FSP on strengthening was more pronounced on the AC + T4 sample with noticeable improvement in both YS and UTS values. However, the YS of the AC + T7 + FSP sample was not improved significantly over the AC + T7 sample though the UTS of these two materials did show an obvious difference. It is anticipated that within the FSP nugget, the thermal history and intense plastic straining of the metal caused the strengthening phases that originally presented in the aged metal to dissolve and to return Cu to solution; therefore, during subsequent cooling, the strengthening precipitates could not nucleate and grow. It is of interest to know whether the FSP-treated nugget would harden in response to an aging heat treatment. In this study, we aged FSP-treated A206 specimens at 155 °C for various times. Figure 6 shows the aging curves of the FSP’d A206. The material did exhibit an increase in strength accompanied by a decrease in ductility indicating age-hardening taking place. The peak YS was 320 MPa after aging for 36 h. In contrast, there was only a slight increase in UTS when aged up to 36 h. Elongation decreased gradually from 23 to 10% between 4 and 50 h, and it remained around 8% (even up to 100 h of aging). Tensile properties of the FSP’d A206 as a function of aging time at 155 °C. A the first quantity used in the Dixon and Mood method, B the second quantity used in the Dixon and Mood method, S0 lowest or initial stress level, Sd stress increment, i stress level, ni number of the less frequent events at the numbered stress level i, μS,FL mean of a fatigue limit, σS,FL standard deviation of a fatigue limit. Experimental staircase test results at 108 cycles for (a) as-cast A206; (b) FSP’d A206. S–N curves of the as-cast A206 and FSP’d A206. The influence of FSP on the fatigue behavior of A206 is significant. 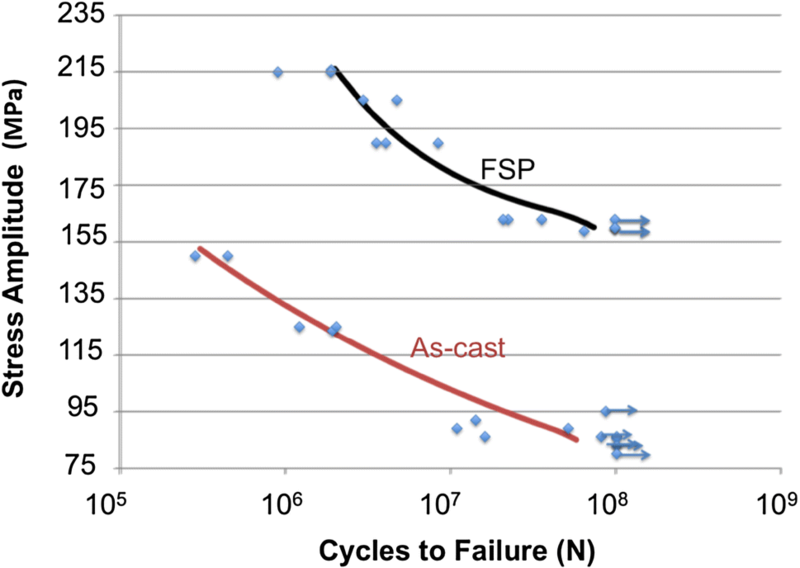 Compared with the as-cast material, the FSP’d material exhibits not only a much improved 108 cycle fatigue strength, but also improved fatigue resistance in the higher stress amplitude regime. The FSP material shows improved fatigue lifetimes at significant fractions of the yield stress. At close to 80% of their respective yield stresses, the as-cast and FSP’d materials have lifetimes of about 5 × 105 and 1 × 107 cycles, respectively. The total fatigue life consists of the number of cycles required for crack initiation and for crack growth and propagation leading to failure. For cast Al alloys at high stress amplitudes, a crack is readily initiated by a casting defect. In these cases, fatigue life is dominated by the crack growth and propagation stage because the crack initiation time is short.26,27 FSP significantly lengthened the fatigue life at high stress amplitudes. This implies that FSP had an impact on the number of cycles required to initiate a crack. As discussed below this is believed to be influenced by the impact of FSP on the population of pores as previously noted. 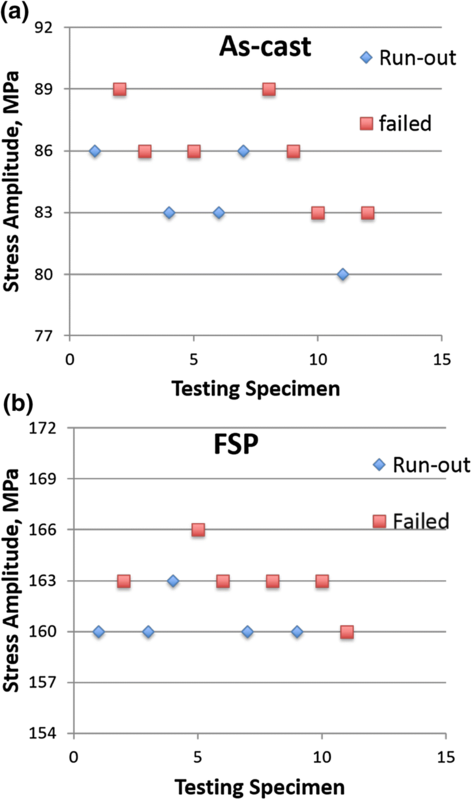 Fractographic examination of failed fatigue samples from both the as-cast and FSP’d materials revealed significant differences between the two batches. Figure 9 contains images exemplifying fatigue crack initiation sites observed in both type specimens. The fracture surface of the as-cast specimen had porosity features on the fracture surface. Pores with dimensions up to 200 μm were observed (Figure 9a). The porosity features were the initiation sites for fatigue cracks especially when they were located near the surface of the specimen. The non-spherical shape and the dendritic structure of the aluminum that defined the bounds of the pores indicate these were microshrinkage porosity. The ECD of the porosity feature in 9a was measured as 109 μm. 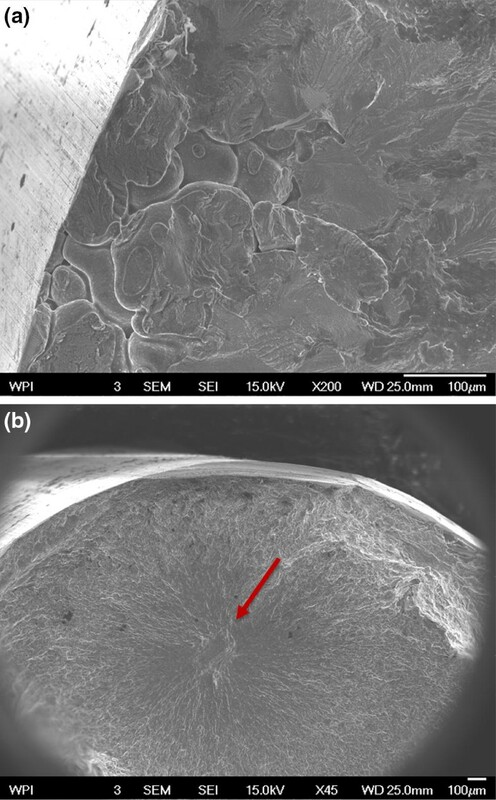 Fracture surfaces of 14 as-cast specimens were closely examined with SEM, and all cracks initiated at microshrinkage pores located at or very close to the specimen surface. Table 2 summarizes these observations on 14 sets of failed fatigue samples of the as-cast material. Approximately one-third of the fatal cracks were initiated from multiple porosity features that were in close proximity to each other (marked with M in Table 2). If a fracture surface contained multiple pores, the ECD of the largest porosity is listed in Table 2. This work shows that in the as-cast material, the crack always initiated from a shrinkage pore, and there was no obvious correspondence between the ECD of the pore and the applied stress amplitude. Fatigue crack initiation sites of (a) as-cast A206; (b) FSPed A206. As reported previously in this study, friction stir processing can eliminate 97% of porosity features, and this significantly reduced the possibility for a crack to initiate from a porosity. Figure 9b is an SEM image taken from a typical fracture surface of the FSP’d fatigue specimen, and it was clearly shown that the crack initiation site was a non-porosity feature. This feature (marked with the red arrow) acted to concentrate stress sufficiently to initiate a crack, and it was much smaller than the porosity in the as-cast material. Figure 10a is a composite micrograph showing the fatigue crack path in the as-cast specimen. The crack initiated from a pore at the sample surface near the right side of Figure 10a (but not specifically shown in that figure) and grew along a tortuous path through the specimen. 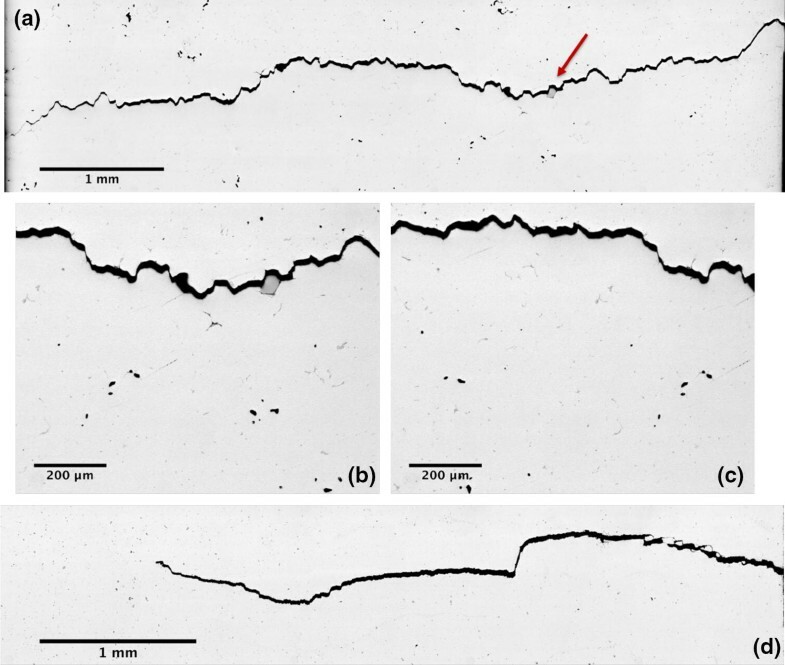 The tortuous path is attributed to the scale of the microstructural features (dendrites) and the change in slip conditions at grain/dendrite boundaries.28 The average grain boundary spacing of the as-cast A206 was about 200 μm, and portions of the crack path seem to have a macro-roughness somewhat consistent with that dimension. Apart from grain boundaries, some of the intermetallic phases influenced crack growth in two modes as depicted in Figure 10b, c. Figure 10b shows where the crack was deflected around a particle with a blocky morphology. On the other hand, particles with a higher aspect ratio and smaller thickness dimension were just sheared (Figure 10c). Figure 10d shows the crack path in the FSP’d specimen. The crack path is not as tortuous as that in the as-cast specimen. This is expected since the aluminum matrix grain size is greatly reduced (≤ 10 μm), so the crack path deflection at grain boundaries will be at a much smaller scale. Much of the improved fatigue lifetime in the FSP’d material is attributed to the increased difficulty in nucleating the crack that would eventually grow and lead to failure. 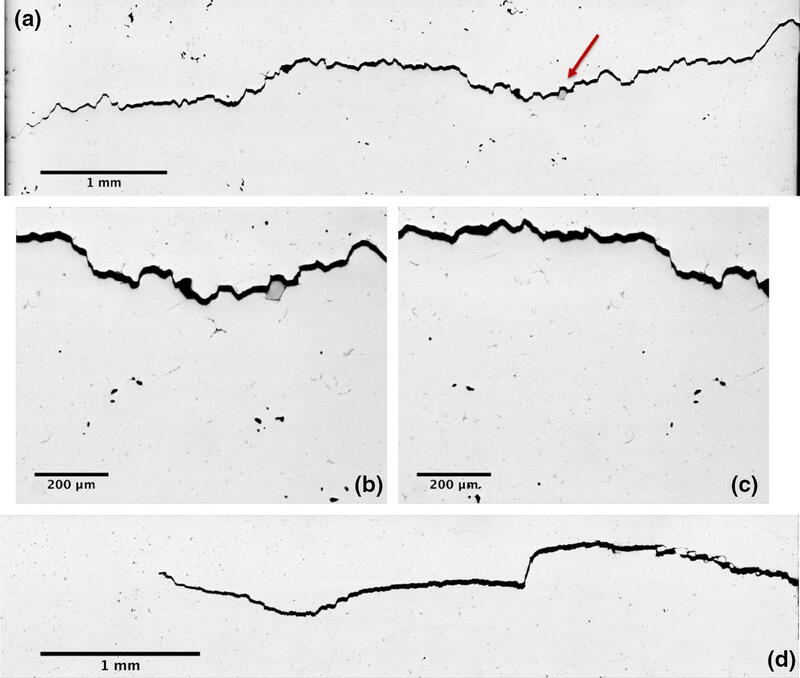 Fatigue crack morphology: (a) crack growth path through the as-cast specimen; (b) interaction of crack with a round second-phase particle; (c) crack breaking through needle-like-shaped second-phase particles; (d) crack growth path through the FSP’d specimen. Figure 11a, b shows representative fracture surfaces of the crack propagation portion of as-cast A206 fatigue samples. A mixture of transcrystalline (broad, flat features) and intercrystalline fractures is observed. The roughness caused by the relatively long scale slip planes within the dendritic aluminum structure is influencing this fracture path similar to that observed in Figure 10a. 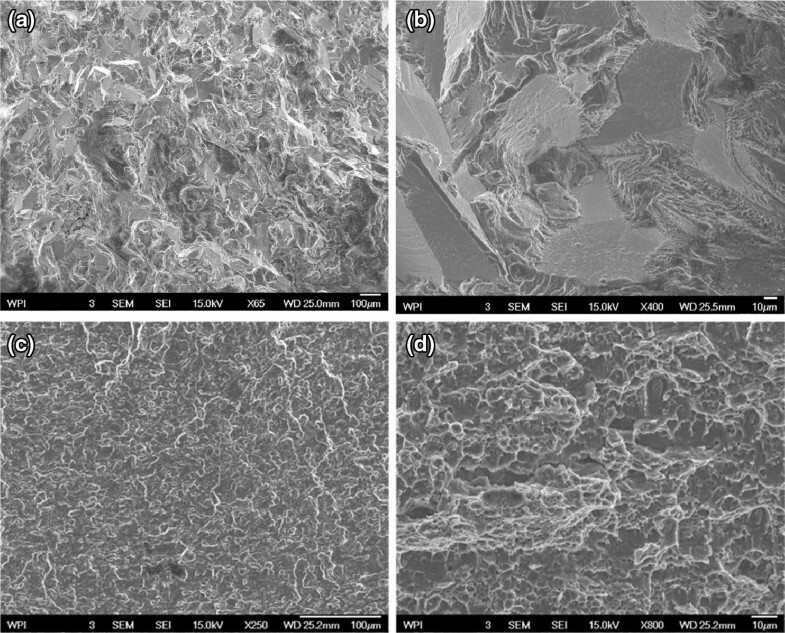 SEM micrographs showing typical fracture surfaces of as-cast A206 and the FSP’d A206: (a) as-cast A206: crack propagation region; (b) as-cast A206: a higher magnification micrograph showing the both transcrystalline and intercrystalline fractures in the crack propagation region; (c) FSP’d A206: crack propagation region; (d) FSP’d A206: failure region containing dimple coalescence. The fracture surface of the FSP’d A206 material (Figure 11c) exhibited a finer scale intercrystalline fracture mode consistent with the refined grain structure of the material. Closer inspection, such as in Figure 11d, shows evidence of dimple formation and coalescence which is characteristic of ductile fracture. FSP resulted in the simultaneous improvement of strength and ductility when applied to as-cast A206 alloy. The strength increment is attributed to the combination of a refinement in the microstructure, especially the grain structure, combined with residual dislocation substructure remaining from the friction stir process. The high ductility realized following friction stir processing is attributed to the refined grain structure and reduction in porosity features. When the A206 was solution-heat-treated and aged prior to friction stir processing, it was found that the increment in strength produced by the FSP was not significant; however, the ductility improved. It is expected that the strengthening phases generated during the solution heat treatment and aging process were largely fragmented and dissolved during the thermal history experienced during FSP. Post-FSP heat treatments demonstrated that the material was capable of further strengthening. Significant age strengthening after FSP was accompanied by the decreased ductility. Fatigue properties of the FSP’d A206 and as-cast A206 were investigated with ultrasonic fatigue testing. The S–N curve of the FSP’d material was shifted significantly toward the higher stress amplitude and longer fatigue life region. FSP increased the fatigue strength at 108 cycles from a starting value of 85 MPa for the as-cast condition to 165 MPa after FSP. The increased fatigue performance of the FSP’d material is attributed to the significant increase in strength and the reduction of population of effective crack nucleation sites, which for the as-cast material, was found to be shrinkage porosity. 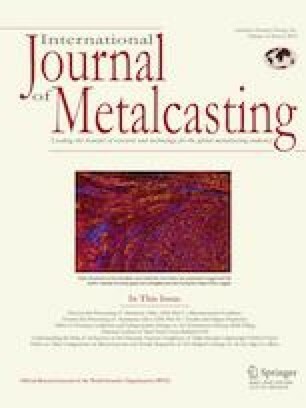 The authors gratefully acknowledge the member companies of the Advanced Casting Research Center (ACRC) for their support of this work and for their continued support of research focused on the science and technology of metal casting at Worcester Polytechnic Institute.